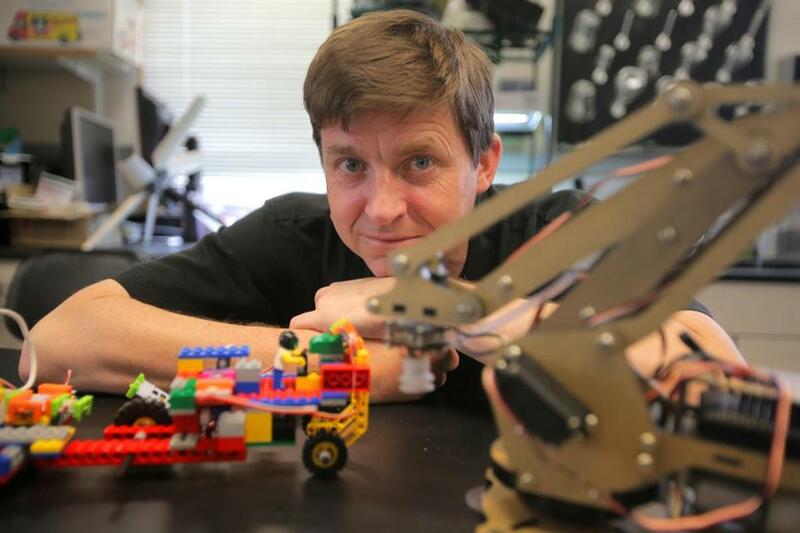 In his Boston College laboratory, Mike Barnett develops teaching models for use in classrooms. China’s educational system tends to prize rote learning over critical thinking — an approach the government believes is holding back the country. Now, Chinese officials have found an advocate to help overhaul their system, right here in Massachusetts. They have enlisted Boston College professor Mike Barnett as part of an effort to inject more creativity into Chinese curriculums, in what is believed to be one of the first partnerships of its kind between an American university and the Chinese K-12 educational system. In May, Barnett traveled to China to meet with educators and presented his lessons to hundreds of teachers at a conference. Over the past decade, Barnett, who teaches in BC’s Lynch School of Education, has implemented his hands-on, problem-based programs in about 2,000 schools across the United States. His lessons address complex questions: Which types of trees are better at taking pollutants out of the air? How can you access healthy produce in an urban environment? The students tackle the problems with a variety of disciplines, such as biology, physics, mathematics, and chemistry. Barnett said his aim is to teach students that in the real world, subjects like math and biology are integrated, and that a problem might not have a “right” answer. “It makes all the individual disciplines and what you’re learning in school actually mean something,” said Barnett, 44, who is from Waltham. His work caught the attention of Kelvin Cui, who promotes innovative approaches for teachers in China. Cui said about 40 or 50 schools, mostly in southern China, have expressed interest in the lessons. Cui met Barnett at an MIT fair and said he was impressed that the lessons encourage students to think about larger issues such as how to increase food production or prevent damage to the environment. “That’s good for the future,” he said. With Barnett’s approach, Cui hopes that China will shift its focus away from test scores so students can learn physics, chemistry, and biology in an integrated and hands-on way. The Ministry of Education in China wants teachers to engage students in new ways so the country can build a better workforce, said Charlotte Mason, a visiting researcher at the BU Center for the Study of Asia. The reforms would transition China from its manufacturing-based economy to a service-based one, meaning fewer young people would work in factories and could instead pursue jobs in high tech, management, and at think tanks. Chinese officials have turned to Mike Barnett to help overhaul their system, which tends to prize rote learning over critical thinking. Mason said there has been a lot of pushback, particularly from parents, who are worried that this change could hurt their children on a high-stakes college entrance exam. “They’re not convinced that creativity will result in higher test scores,” she said. The nation's teaching style focuses on the repetition of patterns, she said, which can be effective when learning the Chinese language or math. The classes are generally taught as lectures with limited input from students, Mason said. “[Students] feel constrained to soak up everything, to respect the teacher; it’s a very respectful, quiet way of learning,” she said. Earlier in his academic career, Barnett could have never have predicted he would be developing curriculum materials in China. He was pursuing a doctorate in astrophysics when he had the opportunity to work with fifth-graders and found that he could teach the young students the same concepts taught at the college level. After that, he changed his course of study to a PhD in instructional systems technology, in which he learned how to teach kids using technology. Barnett, who grew up in a poor county in eastern Kentucky, said he wanted to target under-resourced schools that serve low-income students. David Blustein, also a professor in BC’s Lynch School, has worked with Barnett for 12 years and described him as a curious person who always has a wealth of ideas. “Mike is arguably one of the leading creative geniuses of developing hands-on curriculum for students,” Blustein said. By focusing the curriculum on social justice, Barnett makes issues “come alive,” he said. 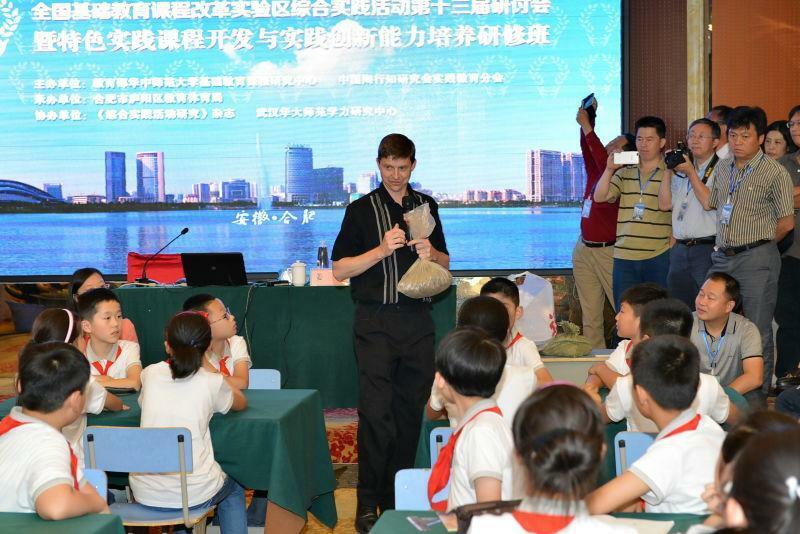 At the May conference in Hefei, China, Barnett gave a lecture to about 500 teachers, and worked with a group of young students through one of his lessons. Barnett asked the students to clean a dirty water filter by giving them fake money to “buy” materials. But there isn’t a right answer to this problem, he said, and the most expensive materials weren’t the best ones to use. In the coming months, Barnett and a team of BC students will analyze the Chinese curriculum and modify their existing lessons, while studying Mandarin. The materials will be licensed to China, and his team will use the money to further fund their work. Barnett also has plans to bring over Chinese students in the summer to work with Boston Public Schools students. “We will learn as much from them as they will from us,” he said.